Venue: Luzhniki Stadium, Moscow Date: Weds, 21 May Kick-off: 1945 BST Coverage: Live on ITV1 and Sky Sports 1, BBC Radio Five Live, BBC Radio London 94.9, BBC Radio Manchester; BBC Sport website. Chelsea and Manchester United will make history on Wednesday when they meet in the first all-English Champions League final at Moscow's Luzhniki Stadium. Both sides have shrugged off concerns about the pitch, which has been called "disappointing" by the groundsman. Chelsea are confident Ashley Cole will overcome an ankle problem but Sir Alex Ferguson's side have no injury worries. United are seeking their third triumph in the competition, while Chelsea have never made it this far before. The final falls 50 years after the Munich air crash claimed the lives of 23 people, including eight United players. Two English teams in the final. Even if you don't support Manchester United or Chelsea, say it again. Surely it sounds just a little bit good, no? And United, who won the European Cup in 1968 and 1999, will be hoping to mark the anniversary by lifting the greatest prize in European club football. Much of the attention in the build-up to the game has focused on the condition of the pitch. The old synthetic surface was ripped up after England's Euro 2008 qualifier against Russia in October and a new grass one laid in readiness for the final. But experts decided it was too bumpy, prompting stadium authorities to lay another less than three weeks ago, using turf from Slovakia at a cost of £160,000. Uefa insists the new pitch is good enough but BBC Radio 5 Live's Alastair Yeomans said: "If you look closely you can see where it has been patched up, particularly around the centre circle. It's possible the ball won't run true in places." Groundsman Matt Frost had claimed last week that he would provide a "Rolls-Royce of a pitch" for the final but now he has reservations. "I'm totally disappointed with the whole project and what we are presenting for the final," conceded the Englishman. The two teams trained on the pitch on Tuesday and declared themselves happy. "The pitch is the same for both sides and if get the footwear right we will be fine," insisted Chelsea skipper John Terry. "We are not worrying about that at all." 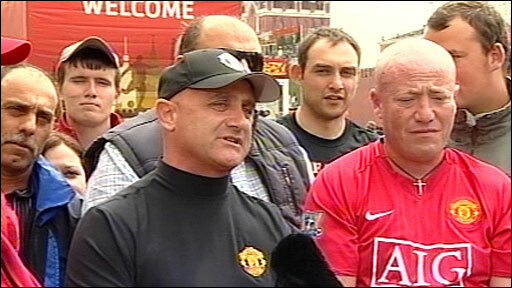 Ferguson added: "I think Uefa have done their best. You have to remind yourself that Old Trafford in January or February is not the best in the league." Chelsea suffered a late injury scare when left-back Cole was injured in a tackle with team-mate Claude Makelele. But both teams are expected to be at full strength for the game, which will be played in front of 69,500 fans inside the stadium and a television audience of millions. More than 40,000 English fans are expected to travel to Moscow to watch the match. The Ministry of Foreign Affairs in Russia has agreed a visa-free regime for the region from 17 May to 25 May for all fans with a valid match ticket. But fans have been warned of the dangers of excessive drinking. The city has special 'drink police' who travel around with mobile cells, looking for drunks, and if those cells are full, offenders risk being taken to 'sobering houses'. The game will kick off at 2245 local time and Chelsea midfielder Frank Lampard admitted it would make for a "slightly longer day". However, United defender Rio Ferdinand joked that "it wouldn't matter if the game was played at four in the morning". Both teams are packed with European experience, with 13 players out of the 22 lining up likely to have already played in a Champions League final. Slovakian Lubos Michel is the match referee. He officiated in the Champions League semi-final between Chelsea and Liverpool in 2005, when Luis Garcia was controversially award the goal that resulted in the Reds progressing to the final. What can UK fans expect in Moscow?